The first field trial of genetically modified (GM) potatoes resistant to potato blight conducted in Uganda from October 2015 to January 2016 has been completed at the Kachwekano Zonal Agricultural Research and Development Institute (KaZARDI) of the National Agricultural Research Organization (NARO) near Kabale. 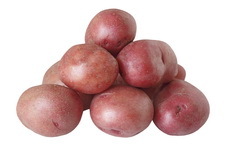 Twelve highly resistant GM potatoes of ‘Desiree' and one of ‘Victoria' varieties from the International Potato Center (CIP) showed extreme levels of resistance compared to the non-GM plants of the same varieties. Using genetic transformation, three resistance (R) genes from wild relatives (Solanum bulbocastanum, and S. venturii) were transferred into farmers' preferred varieties and the results are encouraging. A number of partially resistant varieties exist, but these are not preferred by farmers and consumers. This first observation of zero-fungicide potatoes marks an important milestone in the development and future deployment of biotech potato varieties to farmers in Africa that will significantly reduce losses and cost of production. In Uganda, losses due to potato late blight can reach up to 60%, forcing farmers to spray fungicides up to 15 times to protect their crops. About 300,000 smallholder households grow potatoes for their subsistence living and income generation. Losses due to late blight represents between 10-25% of their revenue from potato. For more details about this project, contact Dr. Andrew Kiggundu/NARO (akiggundu@kari.go.ug), or Dr. Marc Ghislain/CIP (m.ghislain@cgiar.org).